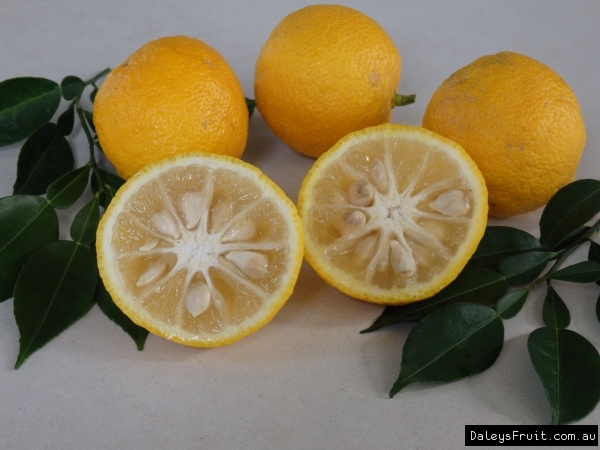 Native to China, the Yuzu has been used and cultivated in this region for thousands of years. The fruit is tart, resembling a grapefruit with mandarin overtones. It is rarely eaten as a fresh fruit but is used to makes sauces, preserves and a popular yuzu vinegar. In Korea thinly sliced fruits are combined with sugar and honey to make a thick marmalade like syrup. Yuzu kosho is a spicy Japanese sauce made from green or ripe yellow yuzu zest, chillis and salt. The yuzu is more cold tolerant than most other citrus, being able to tolerate to -5 degrees. Seedling trees will take 5-6 years to fruit and the fruit will vary in quality. Comments: - Got one fruit in first year which we used every part of..recently it does not look so well. Dropping leaves and the new growth is pale green...fertilising with chook poo and cow manure and gave it epsom salts and iron chelates to help perk it up.